Theologian; born at Kanitz, Austria, Jan. 31, 1859. The descendant of a rabbinical family (see Braunschweig, Jacob Eliezer) and the son of a Talmudist, he received an early training in rabbinical literature while he attended the school of his native city. In 1868 he entered the gymnasium of Nikolsburg, continuing his studies at home, and graduated in 1876. He subsequently attended the rabbinical seminary and the University of Breslau, where he remained until the year 1879. Continuing his studies in Vienna, he graduated from the university in 1881, receiving his rabbinical diploma from I. H. Weiss. Immediately thereafter he was called to teach the religious school of the congregation of Brünn, and upon the death of Daniel Ehrmann (1882) he was appointed by the state as teacher of religion in the German high schools of the Moravian capital. In 1887, simultaneously invited to the rabbinates of Boskowitz and Brüx, he chose the latter position, which he resigned in 1891 to accept the professorship of Jewish history and philosophy of religion in the Hebrew Union College of Cincinnati, which position he still (1903) occupies. Deutsch has been a frequent contributor to the Jewish and to the secular press. 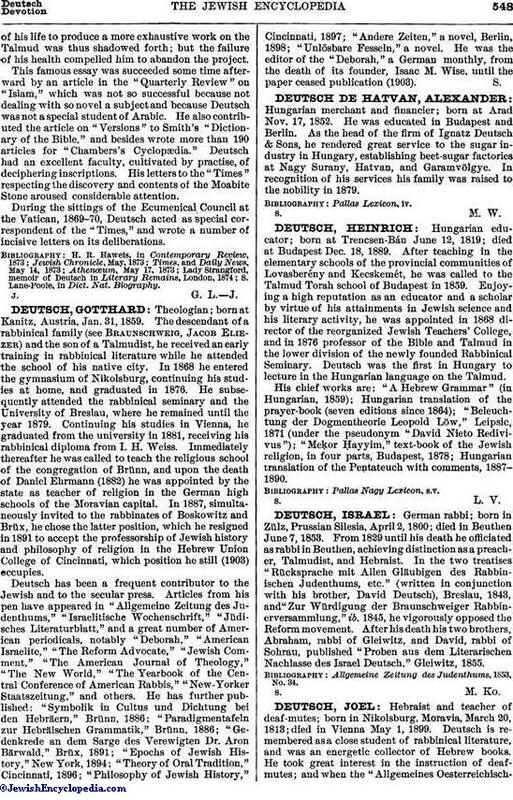 Articles from his pen have appeared in "Allgemeine Zeitung des Judenthums," "Israelitische Wochenschrift," "Jüdisches Literaturblatt," and a great number of American periodicals, notably "Deborah," "American Israelite," "The Reform Advocate," "Jewish Comment," "The American Journal of Theology," "The New World," "The Yearbook of the Central Conference of American Rabbis," "New-Yorker Staatszeitung," and others. He has further published: "Symbolik in Cultus und Dichtung bei den Hebräern," Brünn, 1886; "Paradigmentafeln zur Hebräischen Grammatik," Brünn, 1886; "Gedenkrede an dem Sarge des Verewigten Dr. Aron Bärwald," Brüx, 1891; "Epochs of Jewish History," New York, 1894; "Theory of Oral Tradition," Cincinnati, 1896; "Philosophy of Jewish History," Cincinnati, 1897; "Andere Zeiten," a novel, Berlin, 1898; "Unlösbare Fesseln," a novel. He was the editor of the "Deborah," a German monthly, from the death of its founder, Isaac M. Wise, until the paper ceased publication (1903).